For me, the road between Napa and Sonoma is paved by lifelong friendships. 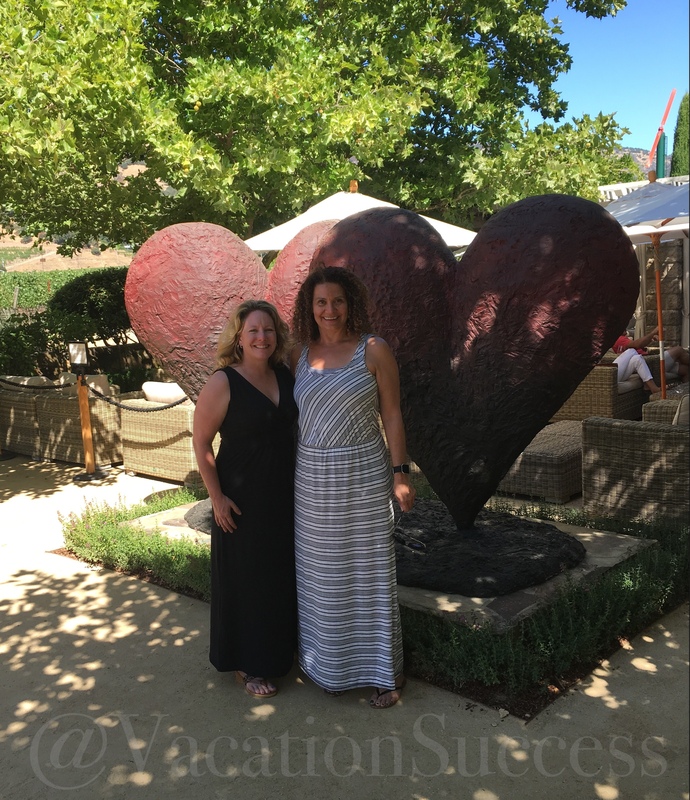 Every trip to wine country has been with friends that will be friends for life. This summer’s trip was no different. Thanks to my bold friend, Teresa, I’ve had the opportunity to take in wine country mile by mile. 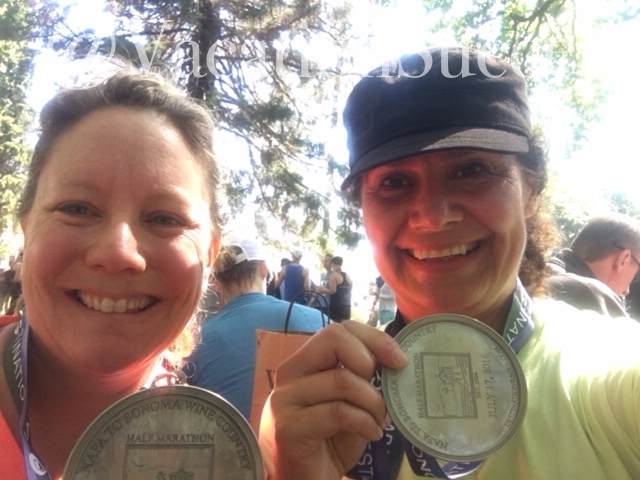 We’ve run two half-marathons in Napa, Sonoma and Healdsburg. It’s a great way to take in this beautiful part of California. There is nothing like running through a vineyard with the morning fog hanging low and the crispy air filling your lungs. Hard earned Napa to Sonoma Half Marathon Destination Races hardware. If you are up for a challenge, and a wine-supported recovery, a half marathon is the best way to take in California’s wine country. Of the two, I’d recommend the October Healdsburg race over the Napa to Sonoma race. In October, the newly harvested vines smell wonderful. And, because it is smaller, less trafficked, the Healdsburg run takes you right through the vineyards. Like any weekend athlete, you need a good team behind you. 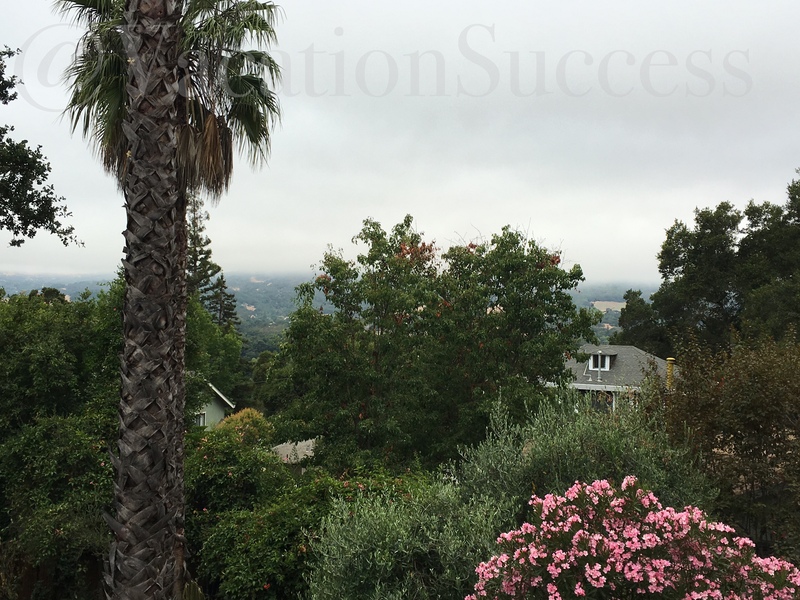 Ours started with a Sonoma AirBnB recommendation from our friend Amy. Janice, who owns the cottage we rented, was an amazing host. She had an “honesty box” filled with pay as you use wine and water to start our visit. We enjoyed a glass sitting on the deck overlooking the Sonoma valley. The beds were way yummier than any hotel. And, the fancy coffee machine made an amazing, strong, long cup. Room with a view. Our AirBnB is perched high on the hill above Sonoma. 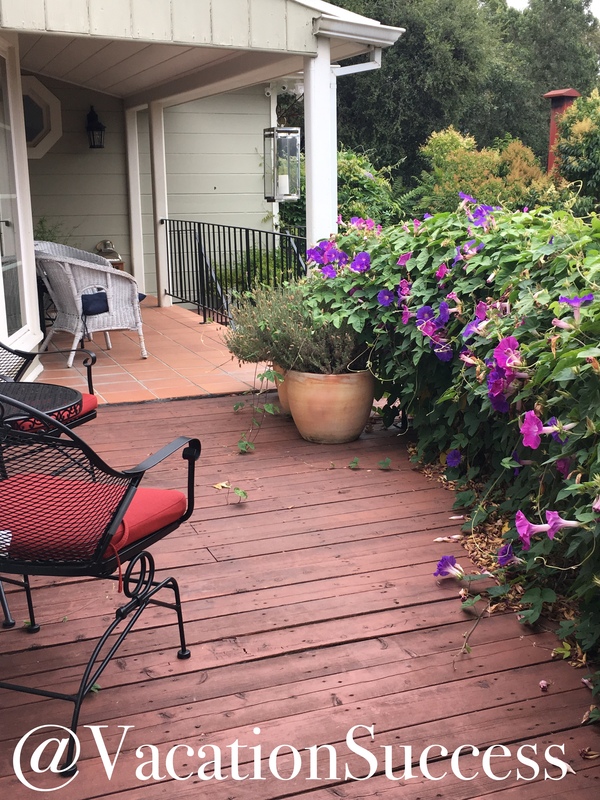 Best place in Sonoma to enjoy a Pinot; our rental cottage’s front porch. 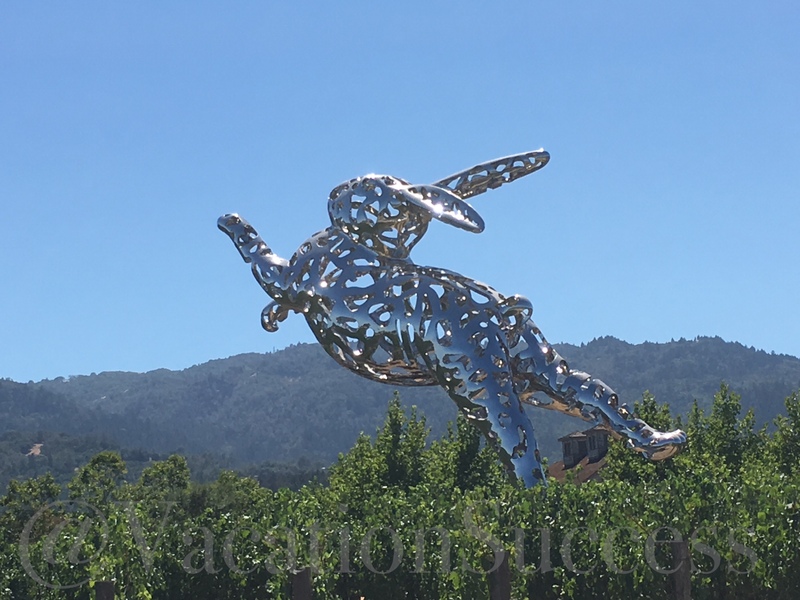 Instead of the usual taper that true, serious athletes go through the day before a race, Teresa and I spent our Saturday in Napa. 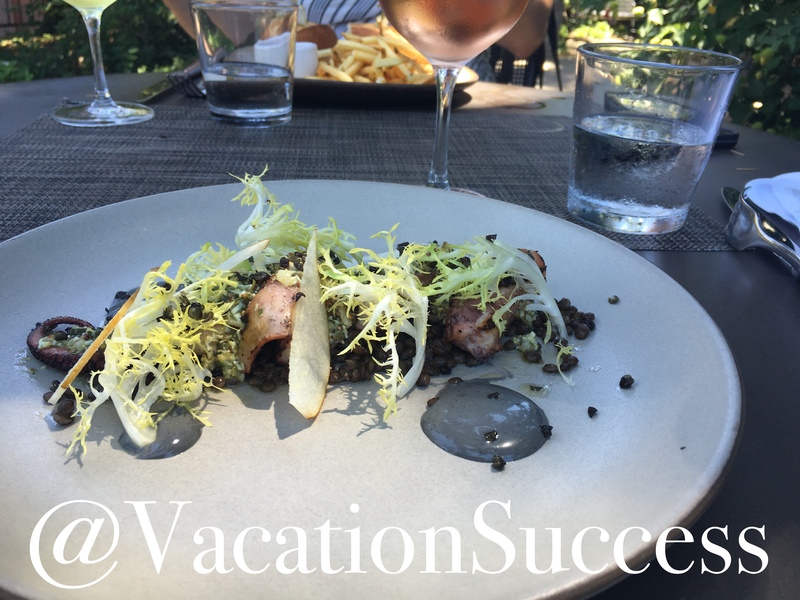 We lunched at Goose and Gander in St. Helena. Yellow-tomato gazpacho, grilled octopus, and a fresh ahi tuna melt. We sipped Rose and chatted up Christopher, our waiter. He made some great winery recommendations. We asked where we could taste and buy wines that aren’t widely distributed. He sent us first to Cliff Lede. Owned by a successful, Canadian construction mogul, the FEL label was our favorite. We brought home four bottles of their Pinot Gris. Next, we visited Merryvale. Two wines into our tasting at Merryvale, we were hooked. Our first wine shipment is on its way, filled with Cabs and Syrah. This is how you taper for a half-marathon in Napa…wine tasting at Cliff Lede. Running was our reason from coming to Napa and Sonoma. Wine tasting was a good distraction. The food was our reward. 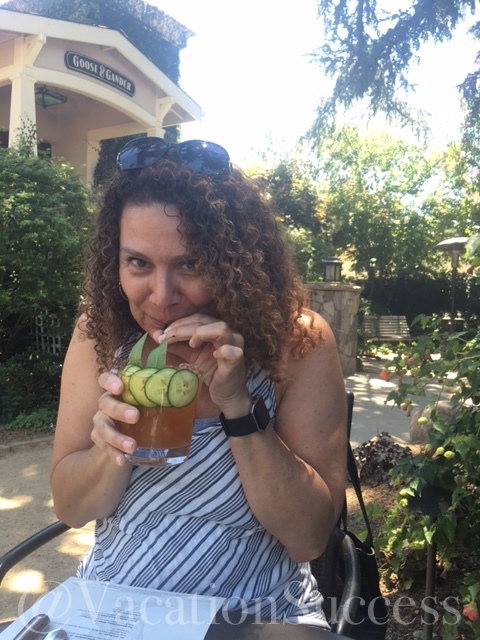 We dined at El Dorado, Goose and Gander, The Girl and the Fig, and made our own Napa Valley picnic from Dean and Deluca. El Dorado and The Girl and the Fig are both on First Street, right at Sonoma Square. At El Dorado, we shared West coast oysters, paella and fettuccine carbonara. The paella was amazing with chorizo, mussels, clams, shrimp, white fish and nutty, saffron rice. The Girl and the Fig had a huge menu. We dined there early evening after our race, swapping stories with other runners who were moaning and groaning as they shuffled into the dining room. We shared a meat and cheese plate, then split ways. Teresa ordered eggplant puree soup. I had grilled peaches with ricotta and balsamic. Our third course was flat iron steak and fries. The garlic aioli was perfect for the fries and the steak was perfectly marinaded. This trip reminded me of the long weekends we used to plan in San Francisco with Evan and Rachel. After spending a day boating in the bay, we’d spend another wine tasting in Napa. Because of those first trips, Napa is a happy place for me. After accomplishing a second half-marathon with Teresa, Sonoma is added to my list of happy places. So, thank you to my courageous friend Teresa and my always up-for-something-fun friends Rachel and Evan, and my rekindled friendship with Amy. Thanks to you, wine country holds unforgettable memories.